No one would possibly have any problems with finding Wrocław. If you drive into the city from the north, down the road no 5, you need to direct to the center, keeping on driving all the way long down the road no 5. In the center the road no 5 will lead subsequently along the following streets: the Bałtycka, the Reymonta and the Pomorska. At the end of the Pomorska St. the road no 5 bends to the right into the Dubois St. At this point you should leave the road no 5 and drive straight on across the Pomorski bridge, and beyond it turn left into the Grodzka St. Subsequently drive down it along the Oder river and after a few hundred meters turn right into the Piaskowa St. Then you must go back on foot along the Katarzyny St., turn left into the Kotlarska St. and after reaching the Kuźnicza St., turn right and go straight ahead. This way you approach Uniwersytecki sq., where castle once stood. 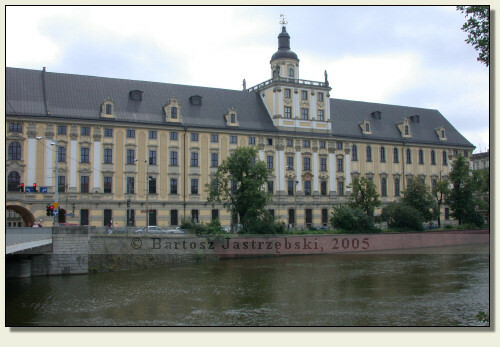 A second castle in Wrocław after Ostrów Tumski emerged on the left bank of Oder river and in literature is styled as an imperial castle. About a proper castle we can say just since the XIVth cent., but earlier existed there manors of Henryk II and duchess Anna as well as Henryk IV. To the northern west of those manors came into being at the start of the XIVth cent. a residence of a king Wacław II or as some people hold that the castle was raised already in the times of Henryk I Brodaty. For sure, however the ultimate shape the castle gained was in the years of 1346-1378 by an affair of emperor Karol IV of Luxembourg. The liquidation of the castle was ordered by another emperor – Leopold I in 1659, while the grounds were handed over to Jesuits. During the next century the castle was being gradually dismantled, and the last building was removed in the XIXth cent. 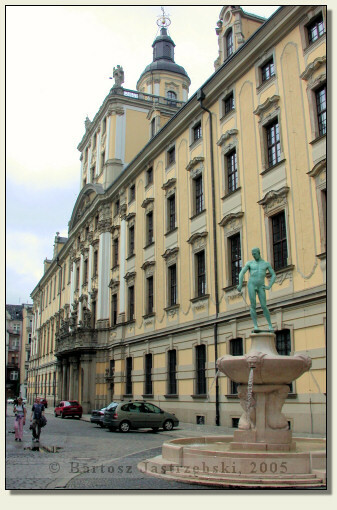 At present at this spot exist the buildings of University of Wrocław, founded in 1702.